I got a Kato Roundhouse this week. 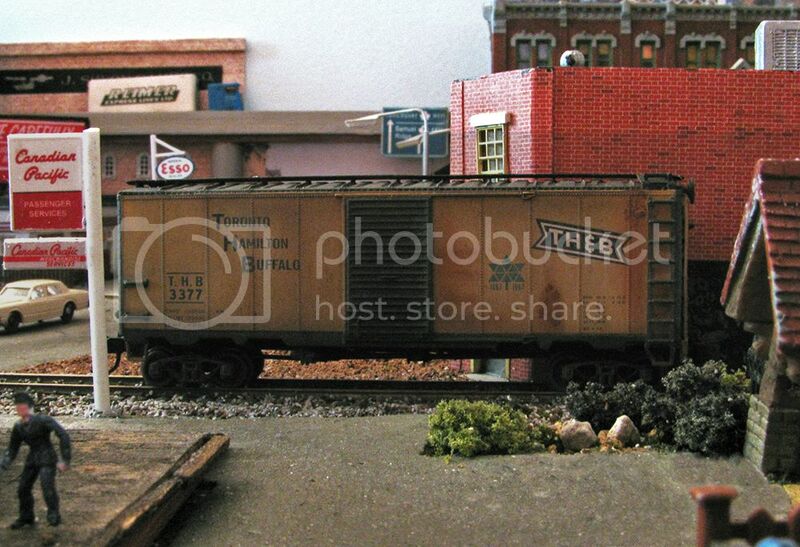 As I was picking it up by the back, the model tilted downward and the 3 tracks slid out and fell on the floor. I picked them up and put them back in place. Two scientists create a teleportation ray, and they try it out on a cricket. They put the cricket on one of the two teleportation pads in the room, and they turn the ray on. The cricket jumps across the room onto the other pad. Modelling is the best medicine for what ails me. I painted this unit maybe 12 years ago and had almost forgotten about it. An ex Reading unit it served at several mills until it was sold to a dealer. 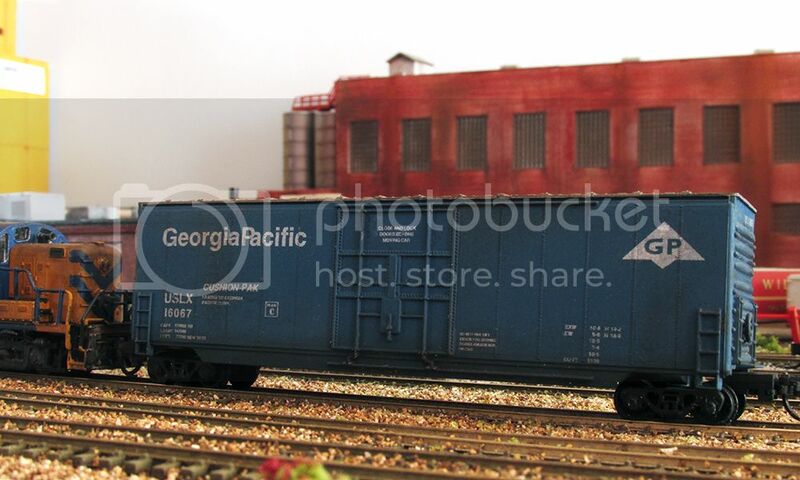 I have a couple GP 50' boxcars that seem right at home at the mill - they have delivered Q92 pulp for white top and will leave loaded with lightweight liner as part of the Domtar - GP switch agreement. I'm rehabilitating some 40' double doors for laminate service - they are a natural for Feuer's products. Tired.... yep..... too tired for trains..... you're kidding, right? 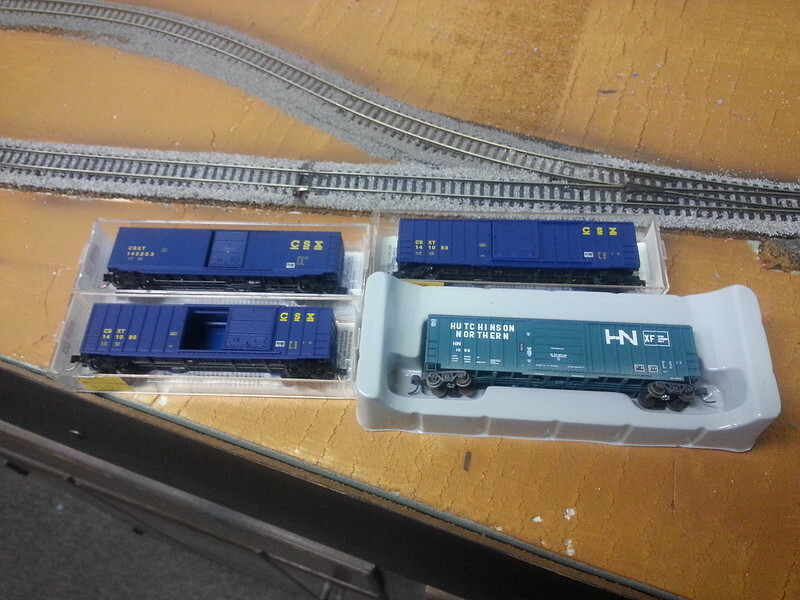 Model railroading isn't saving my life, but it's providing me moments of joy not normally associated with my current situation..... Train are good! 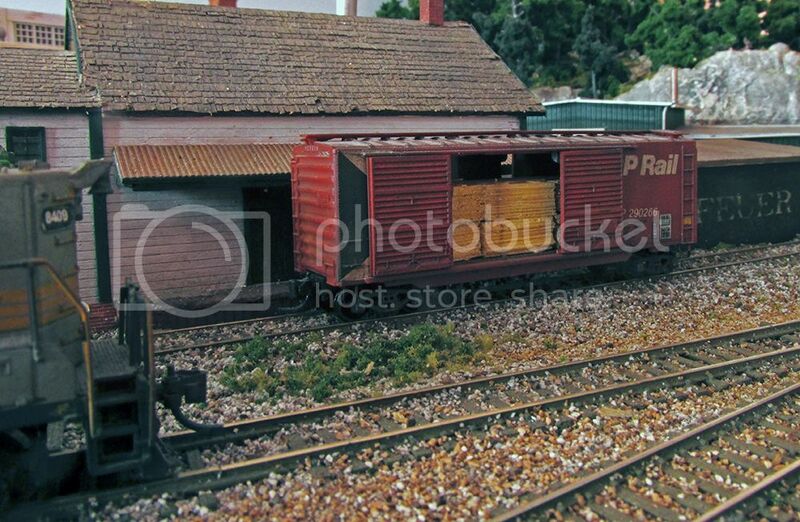 I found a picture for the HN car already, just have to get 2 CSX ribbed boxcars picked out. Mike, you need to take it easy. Yes, trains for you can be good therapy and get those feel good brain chems going. But Man, you must rest too. Please? Those NP coaches are awesome! 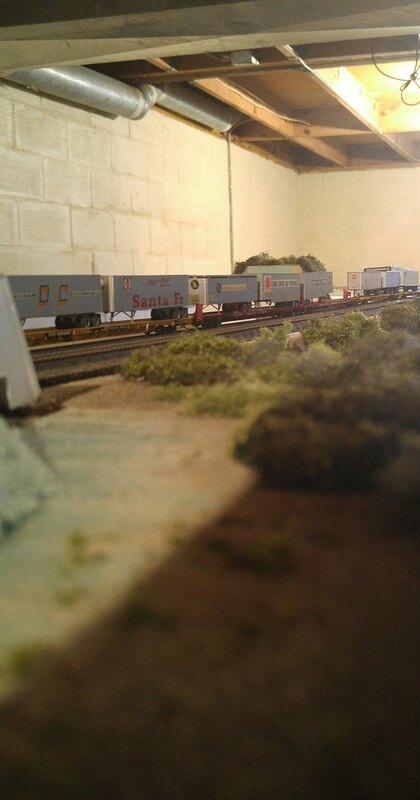 An intermodal train at my N scale Bradylake module set in 1978, just need to get the truss bridge done and some more scenery to complete the module. 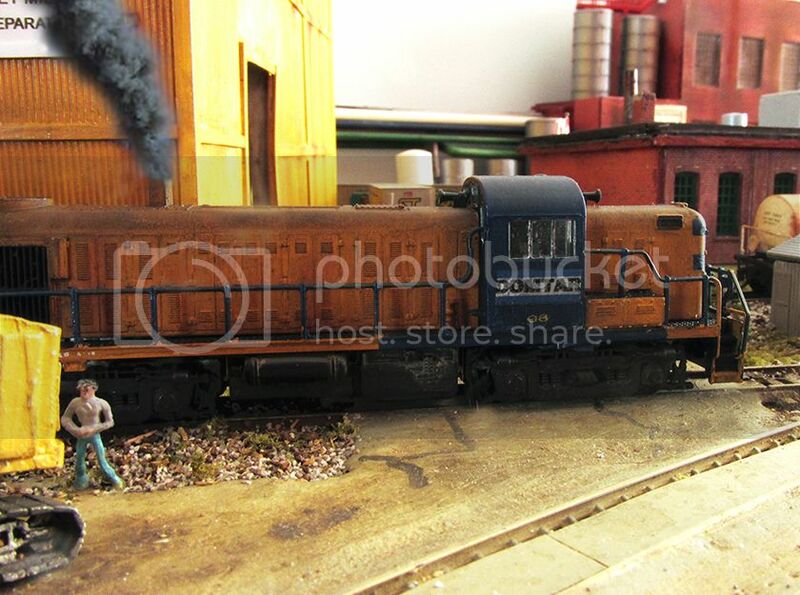 My plans to finish the Woodbine Industrial Track will hopefully resume this summer (we'll be moving in May), but it hasn't stopped me from ordering these two locomotives this week. The CR RS11 was a stroke of luck because the auction listed it as a RSD11. 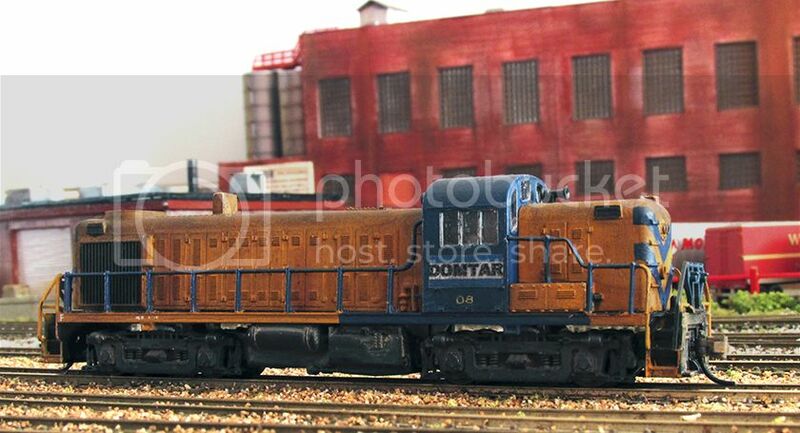 I couldn't pass up an Alco unit in Big Blue colors. 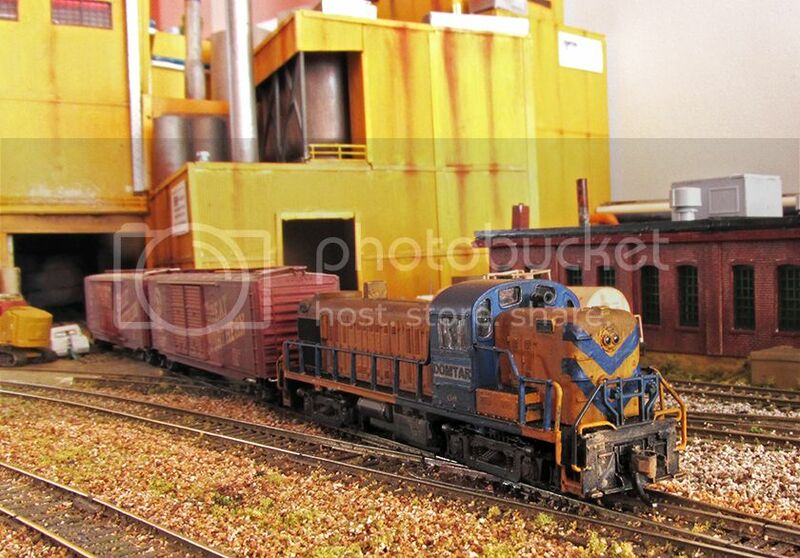 The Guilford GP38-2 is satisfying my interest after I picked up and read Guilford 5 Years of Change by Scott Hartley. I think it's time to run these now! Also, those Northern Pacific coaches are awesome. I love cars that are distinctly "home road". If I wasn't such a Canadian Pacific fan, I could definitely be a SNPF. Richie, I have a photo of that completed bridge. When finished they rounded up all the steam locos they could find and parked them all on that bridge! This type should be welcome to modelers of the Rio Grande. While some were later modernized with sealed windows there are a number of pix of these cars. Too bad Napa Valley Wine Train rebuilt these cars with large arched windows... but at least some valuable cars can be modeled using these two castings!!! Definitely nice!!! Passenger Car Photo Index Updated 8/9/17 with 8,402 new links!! !